Awbrey House is a 4 bedroom/3 Bath gulf front beach house that sleeps 12 on the beautiful Gulf Shores beach. Enjoy the beautiful white sandy beaches of the Gulf of Mexico or listen to the soothing sounds of the waves, just sitting on the large gulf front deck or even from the living room through the large sliding glass doors. The deck has a table and 6 chairs as well as extra seating. On the first floor you can enjoy a fully renovated kitchen with an open floor plan to view the beach from anywhere in the main living area. The kitchen has granite counter tops and all new appliances. We strive to have every convenience in this kitchen. We have a single serve coffee maker that will accommodate all brands of K-style cups. Don’t worry, if you don’t want to buy K-cups we also have a regular brew coffee maker. The fourth bedroom is on the first floor with a queen bed and access to the main floor bathroom right outside the door. This room overlooks the swimming pool. The master bedroom is upstairs with its own private balcony. The master features an on suite with a full bath. There is a king bed in this bedroom. There are two other bedrooms upstairs, one has a queen bed and the other has two sets of bunk beds. There is also another bathroom on this floor. The laundry is on the second floor with a full size stack washer and dryer. All bathrooms have hair dryers and all bedrooms have charging ports in the alarm clocks for your electronic devices. All the furniture is new and the kitchen was totally renovated in October 2016. The pool is shared with the house next door that also sleeps 12. All the bedrooms have flat screen TVs as well as the living room which has a large TV. Cable and internet are available in this lovely gulf front home. There is a grilling area under the deck with a large charcoal grill, a picnic table and a bench for everyone to sit while you’re waiting for your food to get ready and to enjoy visiting with family and friends..
You have covered parking for two cars with additional non- covered parking. FREE WIFI. This is a non-smoking, no pet, walk-up. No elevator. NO PETS! This property is a Saturday to Saturday rental only during peak season. 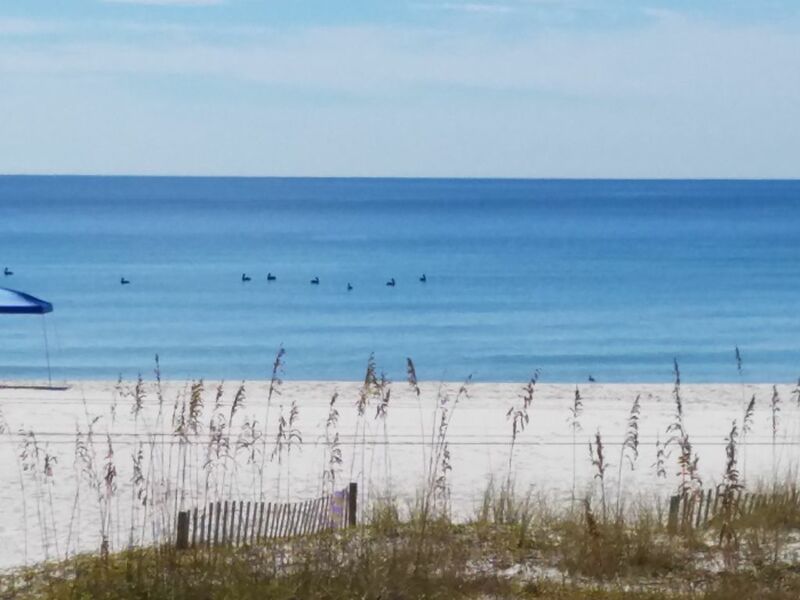 Winter Rental on Gulf Shores. Location was great. The unit does need updating! There was an issue with cockroaches an attempts to eliminate were not successful. Overall the stay was great and you could not beat the short walk to the ocean and hear the waves at night. Not a place for someone who can not walk steps. Thank you for taking the time to review this unit. After you reported the issue with the roaches at your departure we sent the exterminator out a second time. We have had no other problems reported. This unit was totally redone two years ago. It has all new furniture, new cabinets and granite counter tops and new stainless steel appliances. We are going to remodel the bathrooms soon. Hope to see you again soon. We got along very well with the Awbrey House. It setson the beach, just like we wanted and was just the right size for our 9 people. We are so happy that you enjoyed the Awbrey House! Call us when you are ready to plan your next trip, we will be ready to help you! We really enjoyed our stay at the Awbrey house. The pool was great and we loved being right on the beach. My two request would be stronger bunk beds in the bunk room. I was afraid my grandkids might break through the bottom. The other would be more pots, pans, and skillets in the kitchen. I love to cook breakfast when on vacation. Other than that the house was awesome and we had a great time. We had a great family vacation at this house right on the beach. We spent days on the beach and grilled at night. When we were tired of all the sand we swam in the pool. The house had floats and boards for the beach and pool if you didn't bring any. The kitchen had everything we needed and the extra ice maker came in handy! We are so pleased that you and your family enjoyed you beach vacation at The Awbrey House! We hope to see you again next year! Wonderful stay at the Awbrey House. Very clean, well maintained, modern with all the amenities. Just perfect for our group. Most importantly, the view from our decks was amazing. Ocean front property was the best. So glad that you enjoyed your stay at the Awbrey House! Call us for your next beach getaway! Great stay for our four generation family! Our second year to vacation at Awbrey House. Located away from main beach but not isolated, due to public access boardwalk next to house. Plenty of space on the beach to set up. Watched dolphins from the deck every day. Property managers had broken tv fixed quickly!